Ann Allan: Send in the Clowns. 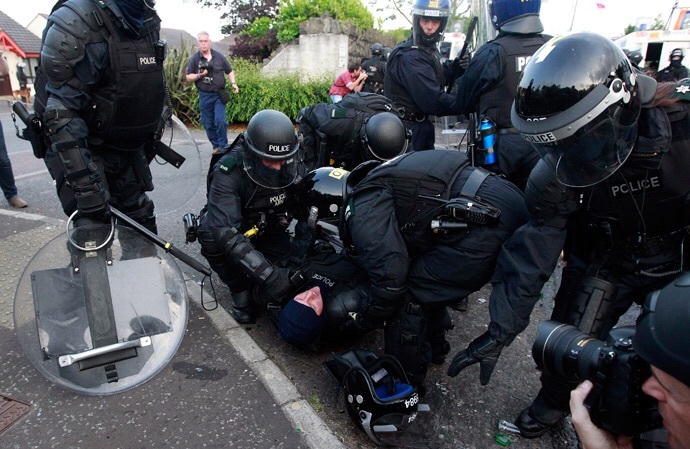 Did you like myself and thousands of others stand beside the police at Twadell Avenue and watch a small bunch of thugs launch a horrific attack on our police force? Thanks to the fortitude of RL we watched from behind the camera, as young boys and teenagers held Belfast up to ridicule throughout the world. We gasped in horror as a missile hit its target and a policeman slumped to the ground. We saw him having to be literally dragged away by other policemen eager to protect him and get him to safety. We were able to see at close hand what these men have to put up with when crowds are brought on to the street without supervision. Which begs the question, why were the nationalists out at the other side of the road? Why didn’t they go to their homes and leave the police to deal with the situation, or have riots now become a spectator sport? We hear about police brutality. We were only defending ourselves, is the usual excuse. Well last night there was no police brutality, the police were stoic and patient. I would have been tempted to have gone across and grabbed Joey/James the clown and shoved him in a paddy wagon until he calmed down. Close up pictures of the crowd showed middle-aged women laughing and egging on the young bucks who thought it clever to attack the police, because the Godfathers are their idols and they listen to their outdated rhetoric. Young children looked on, cheering when a missile hit home. Where were their parents? Behind them? Enjoying the spectacle with a can in their hand? 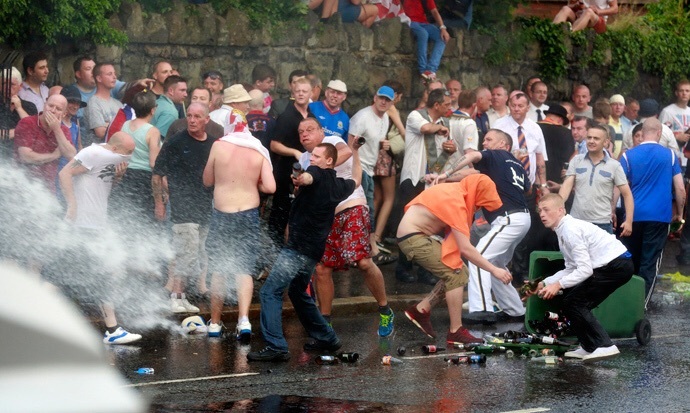 I would suggest that in future the water cannons have a coloured dye added to the water. It would make identification of these thugs a lot easier. Maybe I’m naïve, but I have been around a long time and last night was my first look at a riot from the policeman’s perspective. I scanned the crowds for evidence of a politician or a community worker grabbing one of the rioters and telling them to go home but I didn’t see any. This was a PR disaster for the orange order in Belfast. It was a peaceful and enjoyable day everywhere else. Going to bed last night I read that youths in the Bogside were intent in undoing the good work achieved in the city. For goodness sake, somebody, sort it out or we are saddling another generation with this crap. Send in the clowns, don’t bother there here. ← Ann Allan : What is Culture?